Blueberry iced tea is made of the leaves of the blueberry. The blueberry leaves are rich in anthocyanins glycosides (especially high in myrtilline and neomyrtilline. Which reduce the level of sugar in the blood) organic acid, Tanning Materials, flavonoids, triterpenic compounds (oleic acid and etc) vitamin c (up to 250mg %) carotene hydroquinone and other healthy compounds. Composition: Blueberry leaves, sweetener, potassium sorbate. 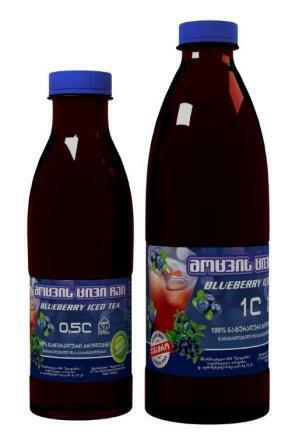 Blueberry iced tea have vision improving, diuretic, choleretic, constipation, anti inflammatory action. It helps to reduce appetite and blood sugar level. Therefore it is recommended for patients with diabetes mellitus. Recommended storage condition: 8-25 °C, protected from light place. Release form: 0,5 l and 1 l in a transparent polyethylene bottle.